The WCA in collaboration with the RSPB and Pembrokeshire Coast National Park Authority have produced the following guidance which should be read if you are taking to the sea to enjoy the British coastline. One of the joys of kayaking on the sea is the freedom to view wildlife in its natural habitat. However, kayakers have a responsibility to develop an understanding of the needs of wildlife in order to minimise any negative impact. It is recommended that paddlers explore the marine environment in small groups both for safety, and to minimise wildlife disturbance / environmental impacts. From the 1st of March to the 31st of July is a particularly sensitive time as birds come ashore to nest. Particularly sensitive sites are steep cliffs and zawns. Many (but not all) of the sensitive sites are clearly marked on the Pembrokeshire Marine Code Maps . • Plan trips carefully and with respect to Site Specific Access Restrictions. • Observe bird’s reactions from a distance. • Never approach closer than 10m. Auks (guillemots, razorbills) incubate eggs on their feet; if they fly off ledges in a panic their eggs are dislodged and destroyed. On open water you may encounter ‘rafts’ of sea birds. Avoid causing disturbance to rafting birds as they may regurgitate food meant for their young / take flight during valuable resting time. Seals haul out to pup on open beaches, and on beaches at the back of caves in Pembrokeshire mainly from August to the end of November. Therefore, unless in an emergency, landing on seal pupping beaches is restricted during these times. Please also avoid landing where there are seal pups or large gatherings of animals at any other time of year. Particular sites of high density are on Pembrokeshire’s many offshore islands and north of St. David’s Head. Many (but not all) of the sensitive sites are clearly marked on the Pembrokeshire Marine Code Maps . 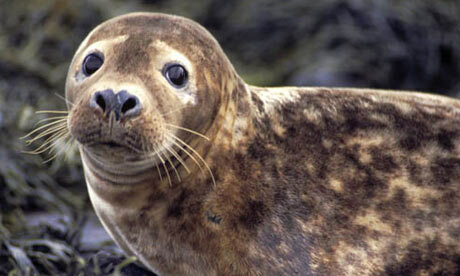 • Do not land on seal pupping beaches from August to the end of November. • Avoid creeping up on seals or approaching seals bow on. • Allow seals an escape route. • Do not disturb mothers nursing pups. Adult females often rest in the water about 10-30m from the shore & their pup - never paddle between the female & the pup. • For the sake of your safety and for the health of the seals themselves do not seek to swim with, touch or feed seals. • Limit observation time to 10 minutes then move on. • Continue on your intended route as this will present predictable movements. • Allow groups of cetaceans to remain together. • Leave cetaceans with young alone. • Always allow cetaceans an escape route and avoid boxing them in. • Leave if you notice any signs of disturbance. Further information and advice is available from the Activities Liaison Officer on 01646 696134 or 07977939325 and on the Marine Code Website.